When making a film adaptation, one of the principle things to consider is how closely you want to adhere to the source material. Fans of that material tend to get annoyed by too many changes, leading to the oft-repeated refrain of "the original was better." There are, however, a few films that diverge very heavily from the source material to create something much greater, such as Robert Wise's 1951 classic The Day the Earth Stood Still, an adaptation so far removed from its source (Harry Bates' short story, "Farewell to the Master"), it is almost unrecognizable. 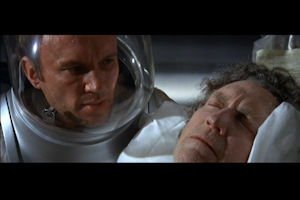 On the other hand, it is possible to adhere too closely to a source, as can be seen in another Robert Wise adaptation, 1971's The Andromeda Strain, adapted from the Michael Crichton novel of the same name. Despite a handful of very minor changes and omissions--the largest being a simple gender swap of one character--the film and novel are nearly identical in every respect. This slavish devotion to the source material may please some fans of the novel, but it does a disservice to the film, as the novel isn't particularly cinematic. 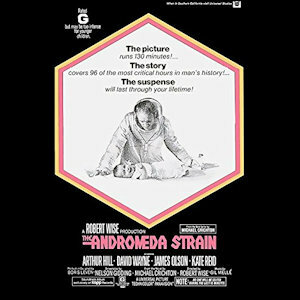 To be clear, Robert Wise's The Andromeda Strain is not a bad film. It's just not as great as it could be, and it is nowhere near as excellent or influential as The Day the Earth Stood Still. Instead, it's a slow film framed and shot like a suspenseful spy thriller from the same period. While it does a good job visualizing the settings and technologies of Crichton's book, one gets the sense Wise was trying to create an atmosphere of tension and intrigue rather than one of scientific discovery and spectacle, and that's where the strict adherence to the source does the most damage to its potential. Crichton's book is suspensful, but not in a way that is easy to translate to film; it isn't particularly visual, doesn't have many dramatic plot reveals, is almost entirely based on technical details not easy to explain with snappy dialogue, and isn't terribly interested in character conflict. It also doesn't help that Wise uses very few film trappings, such as a cinematic score. 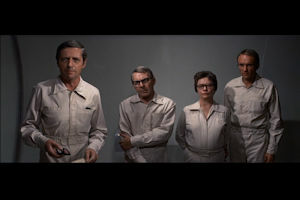 The Andromeda Strain almost lacks a score altogether, with even the climactic central core sequence barely punctuated by a sparse and half-hearted attempt to build any emotion whatsoever. If you completely removed what little music there is and replaced it with something more potent and--dare I say--traditional, the film would feel much more exciting and engaging, rather than dull and dour. Weirdly, though, the thing the movie is most well-known for in film circles is its use of multiple splitscreens three decades before 24 would make them mainstream, a very stylistic device thrown into a film that is otherwise more interested in cinéma vérité realism and Wise's trademark invisible camera. This is the only indication that Wise was willing to take any risk whatsoever with the film, and if he had taken this ball and run with it, perhaps it would have been far more successful as a film, far more cherished today than it is. On the other hand, maybe it would have been a disastrous failure, but still, a failure built on ambition is interesting, whereas the film Wise ultimately made feels anything but. As for the script, where the decision to adhere to the novel is really made, the few changes that are made are a mixed bag. The suggested origin of the titular organism--that something we sent to space mutated to be able to survive up there--is removed. This is fine, because the idea that something with DNA could mutate into something without it (and then mutate again, somehow, even though it doesn't have any DNA to alter) kind of makes no sense. The script also highlights and expands upon the biological weapon angle of Project Scoop and uses it to get a few jabs at militaristic aggression--this is where it really feels like a Robert Wise story--but it's still within the boundaries of what Crichton wrote. Turning Dr. Leavitt into a woman is a good choice and makes her character more interesting, but she is also made far too caustic and cynical to be relatable. I'm glad the script makes her epilepsy more consequential by having it be the reason a crucial detail is missed, but it also makes her failure to disclose it harder to forgive, even as it is more reasonable that a female scientist at the dawn of the sexual revolution would hide it. This all serves to make her annoying, and none of the other characters are much better. Dr. Leavitt may be an awful person, but at least she has more than one dimension to her character. The rest don't: Dr. Stone is the serious scientist; Dr. Hall is the ever-so-slightly less serious surgeon; and Dr. Dutton is the older guy. It also doesn't help that these one-dimensional characters are played by forgettable character actors, with not one notable star among the entire cast. (Side note: I had a Mandala Effect moment when rewatching this movie for the purposes of this review. I could have sworn beforehand that Dr. Dutton was played by Donald Pleasence. No offense to David Wayne--who's fine, I guess--but I really, really wish he were.) It makes sense for the context of the story for these characters to all be similar, as they all come from similar backgrounds and have similar personalities by design, but when even the actors don't really stand apart from one another, it all feels very dry. Their bursts of argument also don't feel earned, because they don't seem to be different enough to have legitimate differences of opinion, save the bickering between Stone and Leavitt when Leavitt wants to take stupid shortcuts because she's a terrible scientist who shouldn't be there. I know I'm being especially hard on this movie, even after I said it's not a bad film, but there's a serious loss of potential here that annoys me. If this were just a bad movie, I'd tear it apart and move on with my day, but because it does so many things well--set design, special effects, plot execution, tone--it makes its flaws more irritating. It all comes down to its unwillingness to deviate from the source material. I love the book, but it's far from perfect. It could easily be made more cinematic if only the people adapting it were a bit more imaginative and willing to reinterpret, but alas, this is a film that takes a different approach. In the end, it just feels... sterile.